All the lawyers in our firm have their current Practicing Certificates and are in good standing at both the Supreme Court and their local Chapters of the Nigerian Bar association (NBA). 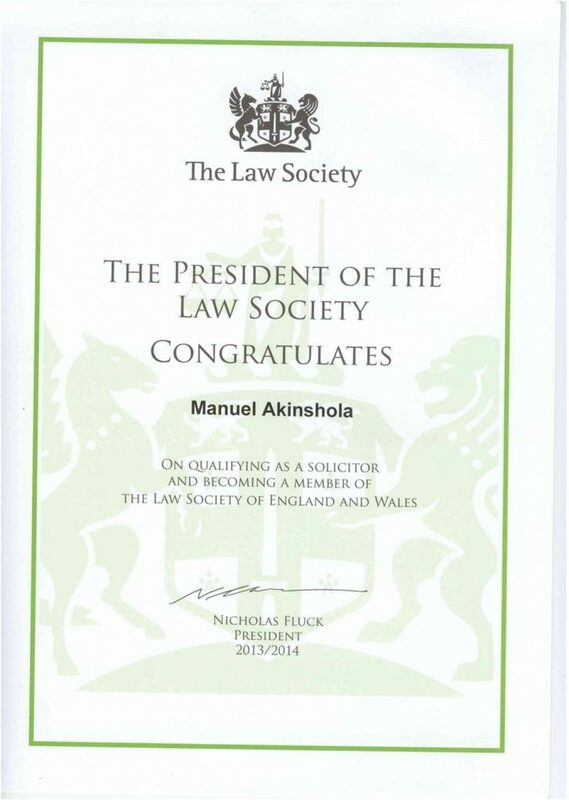 Our team of Barristers and Solicitors is led by Manuel Akinshola Esq. He was called to the Nigerian Bar as a Barrister and Solicitor of the Supreme Court of Nigeria in March 1995. Since his call to Bar, he has been actively involved in the practice of law in Nigeria. As a human rights advocate, he became the Executive Director of Peoples’ Rights Enlightenment and Awareness Initiative (PREAWIN), a non-governmental organization registered in Nigeria. The aim of this organization is to enlighten the populace about their basic rights as provided under Nigeria laws. 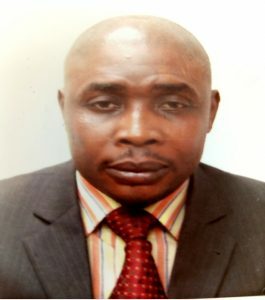 To this end, he has deployed his skill as a prolific writer to publish several books dedicated to educating the Nigerian public about their basic rights. Know Where & How To Safely Buy Landed Properties in Nigeria. 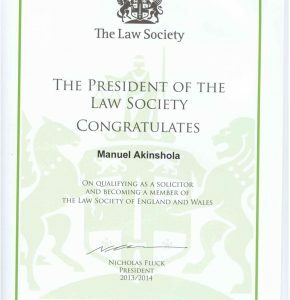 Manuel Akinshola was also the Associate Editor of Reports of Courts’ Judgment of Nigeria, a law report publication of judgments of the Supreme Court of Nigeria. In August 2013, he qualified as a Solicitor of the Superior Courts of England and Wales and is regulated by the Solicitors Regulation Authority (SRA). 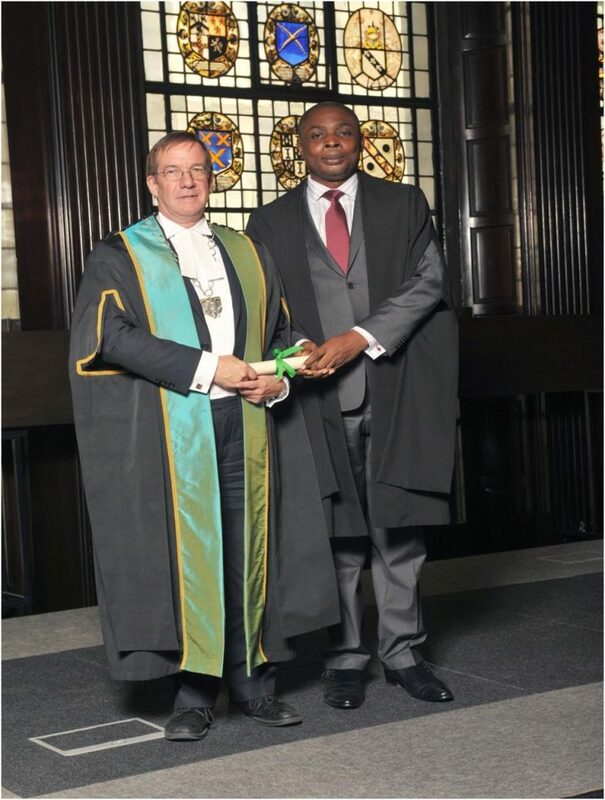 He remains a solicitor in good standing in both Nigeria and England. 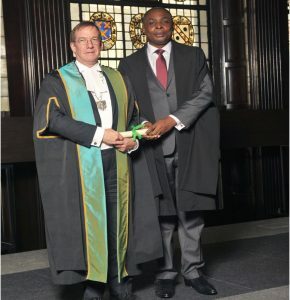 Manuel Akinshola with Nick Fluck President, Law Society of England and Wales at the Law Society Admission Ceremony on Sep 20 2013 at The Law Society, 113 Chancery Lane, London WC2A 1PL.